As a guy, I must admit… these tools are really cool. They’re loud, look like a space-age pistol, and have loaded bullets. They use a .22 or .27 round casing to drive the nail through the wood (or steel) stud (or bracket) and into the concrete. It is really fast and …essentially a gun. 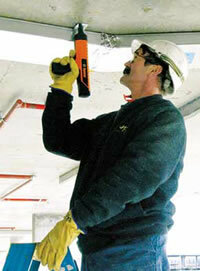 Powder actuated tools (sometimes confused with power, but it’s not) are typically used as a quick method to anchor into concrete. 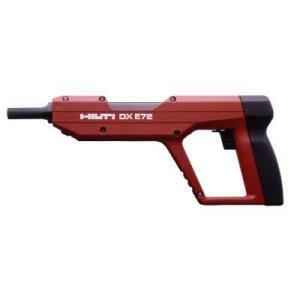 There are a few types of these tools (Hilti, Simpson, Ramset) and there are specific safety precautions and controls that must be in place during use. However, I will focus on the newer hazard that was brought to my attention: airborne lead exposure during their use. I have seen these in use for many years, and at one point it was brought to my attention that lead was listed in the MSDS in section 2 Hazardous Ingredients (lead styphnate) and some of the manufactures caution the extended use of the tool. I actually dismissed the concern for airborne releases. Well, I was corrected. A study done by Liberty Mutual’s Mark Wiggins, CIH, CSP, ARM found that when as few as 50 to 90 loads are used per shift, the OSHA Action Limit can be exceeded. It depends upon the type of load, where work is being done (location), and the type of work (overhead, etc). He also suggests that the airborne exposure can be estimated based upon the number of rounds. There are many alternatives to minimizing this exposure including: using battery-operated, or pneumatic anchoring tools, loads without lead, decreasing the frequency of use, and finally- respirators. A half-face, tight fitting negative pressure respirator is suggested to be adequate. Leave me a comment if you would like the more information about this study. I wonder if you are aware of Hilti’s new lead-free (and heavy metal-free) loads? They haven’t introduced them broadly yet in the US but you may be lucky in getting them on request if you contact their HQ at Tulsa, OK. Good luck! Thank you for your comments. I know of a few contractors who have been able to get them. I have heard they are considerably more $ than the lead-loads. Is the study available online? You seems to be an expert in this field, Great post and keep up the great work, my friend recommended me your blog. I am unaware of anything available online. You might try asking the manufacturers of the lead-free powder if they have any relevant data. Thanks for the question. Nice article. Its realy nice. Many info help me. I am interested in getting more information/specifics about this study. Do you have the contact ino for Mark Wiggins? I have misplaced Mark’s address. I will email you the white board of his paper and that might help finding him. Industrial Hygiene in Construction is powered by	WordPress 5.1 and delivered to you in 0.436 seconds using 31 queries.